Manage more with less, and give owners customized reports exactly how they want them, when they want them, quickly and easily. 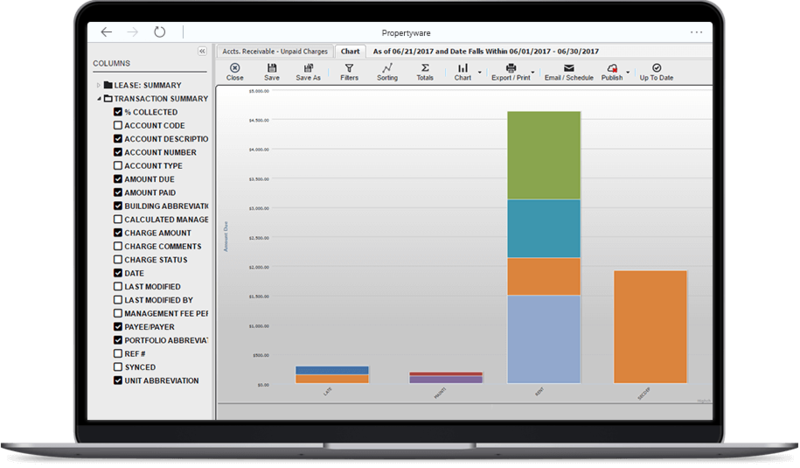 Propertyware Allows You to Create Your Own Custom Reports. Others Can’t. Choose from a comprehensive set of data points to build your own customized reports. Whether you want to see data at the highest or lowest level, you can set up reports to show as much or as little detail as you want, then further customize, organize by folders and more! Driving results requires constant visibility to your performance metrics on a recurring basis. Choose from daily, weekly, monthly or custom recurrences to generate reports as often as you want! Custom reporting starts with the data you want to see, then you need to be able to edit, filter, and sort that data based on your needs! All of this can be done on the fly and saved at the report level! Getting to your data is the most important part of a reporting engine. Once you can see it, you need options to export your data for further use and sharing. Our exporting functionality supports both excel and PDF exporting. Take exporting reports to the next level and drive efficiency! Instead of spending your time digging for the same data time after time, simply email or publish any report and allow the recipient to view it in real-time! Quickly and easily take your data and customize visuals with pie charts, graphs and tables to deliver the most robust online reporting tool built right into your Propertyware account! Tenants now paying rent online with tenant portal and Propertyware Payments. Hours saved weekly with property listing automation and syndication. Increase in portfolio managed internally without adding headcount. Propertyware reporting ‬is a rental property management executive’s best tool for quickly overseeing portfolio performance. Customizable dashboards give the right people the right information at the right time, from accounting to maintenance to lead tracking, for tighter control, greater visibility and accountability for results.